The 2015 Spring Fling in London was graced by dancers from Bucharest including Alina Petrisan. I made contact and recently undertook the long train journey from London to dance in this remote outpost of SCD. Before the dancing on Tuesday 23rd February 2016, I met Alina at her dance studio to hear about her dancing life. As a teenager, Alina excelled in ballroom dancing, competing, and winning, national and international competitions. Then she achieved an ambition of having her own well-appointed dance studio where she teaches ballroom dancing … and now SCD. In 2010, Alina met Wanda Hyde who had been relocated to Bucharest which then enjoyed no SCD. 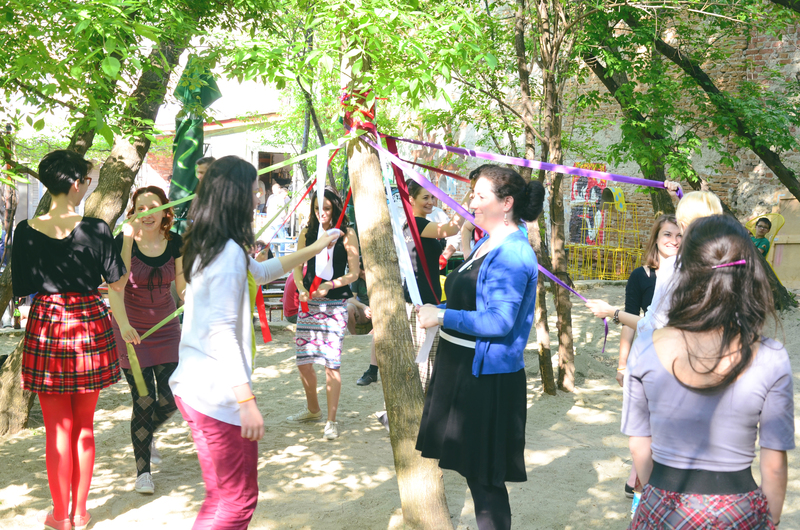 Wanda invited Alison Jackson of South Wales Branch, plus a fellow-dancer, to run a workshop in Bucharest to try to inspire interest. Alina attended and SCD was launched. Alison became Alina’s “mentor”, running another workshop in 2011. Alex Gray provided books and CDs. Indeed Alina joined South Wales Branch albeit never having been there! Fortnights at St. Andrews Summer School followed in 2011, 2012 and 2013. 2011 was subsidised by South Wales Branch and other South Wales Groups. To everyone’s delight, Alina was unstoppable. After one week she was promoted to a higher grade class, and attended and passed the optional Unit 0 course thus attracting the interest and support of tutor Helen Russell. For 2013 a Society Scholarship enabled Alina to attend Advanced Level and Highland classes and participate in the performance of the sword dance at Younger Hall. Also, the BBC interviewed her for the 2013 “Controlled Abandon” programme celebrating the 90th anniversary of the RSCDS. With Alina’s obvious expertise and enthusiasm, she was soon included in Raphaëlle Orgeret’s International Team which competed at the Newcastle Festival in 2013. Alina attended Spring Fling in Lyon in 2014 with another Bucharest dancer, and in London in 2015 with three others. Indeed, some South Wales members travelled to London giving continuing support. Although far from her nearest SCD neighbour in Budapest, and the various courses and events available throughout Europe, Alina conscientiously teaches with the help of many RSCDS books, teaching manual, complemented by the offerings on YouTube. I encountered some interesting ideas. The weekly Tuesday sessions form a pattern: modules of four weekly sessions followed by a “fifth Tuesday”. 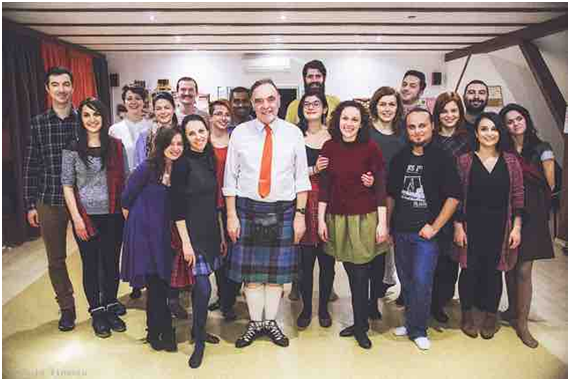 This is an open house occasion when dancers are encouraged to invite their friends to an evening mixing dancing with the traditions of Scotland. In the first 2.5 years there have been seventeen such modules. This “word of mouth” is the most effective form of publicity, with a Facebook page advertising the group’s activities. Alina maintains records of each module and I could see that she has covered many basic formations within a varied dance repertoire. me being a novelty “western” visitor. The previous Tuesday had been a “fifth Tuesday” with a Whiskey Tasting arranged by Jameson’s (although this is Irish whiskey, the original John Jameson was Scottish and married to Margaret “Haig”). dancers, a chef, researched how to make, and cook, haggis with excellent results. There had been difficulties understanding Burns’ Scottish words but I told Alina not to worry – most of us have that problem! 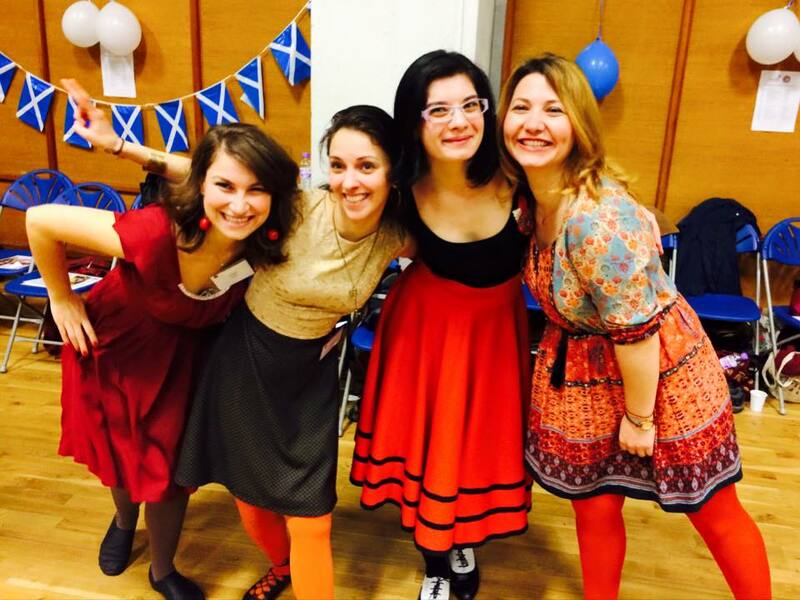 Other themes have been Hogmanay, making sashes, Gaelic language sessions and the history of tartan. Twenty dancers attended my evening, all Romanian apart from one Indian. Everyone spoke English. A personal theory of mine was proved, namely that the further east you go, the younger the dancer! Otherwise the group includes one “real” Scottish member with a Romanian wife and an occasional New Zealander with a Ukrainian wife. One lady, Ancuta, is passionate about everything Scottish. So, when she learned of SCD by word of mouth, she joined. She gives Alina much advice and support. But, alas, Ancuta has never been to Scotland as she hates flying. However I proved that the journey can be made by train! Every dancer has a little book in which attendances and accomplishments are reflected by different coloured pages. These are converted into “points” which can be swapped for gifts. As my evening featured four dances, everyone present accumulated four more points. It is an interesting way to encourage continuity of attendance. Indeed, for teaching myself four dances, I earned four points which I exchanged for a “Highland Dancer” brooch made by dancer Alexandra. with 50 portions of Scottish food prepared to encourage spring to come. All SCD dancers, their friends and collaborators from Alina’s other dancing projects were invited. It was an occasion to promote Alina’s “branding” of SCD activities; e.g. on badges and a little booklet with the pages attached by blue and white ribbons, promoting the group’s activities on pages headed Dancing Scottish, Scottish Party, Scottish Love and Eat Scottish. Alina’s slogan is “Scottish Spirit” – and, yes, this can be understood in two ways. Among the dancers, photographer Tiberiu and film maker Andrada help with SCD promotion. This group felt like a cohesive group. Indeed many dancers retired to the pub socially until about 00.30! Alina wishes to take things to a higher level and aspires to the Teaching Certificate. But this is an expensive proposition. Alina has plans to contact the Embassy and to find sponsors and partners to sustain the project. Alina wants to bring the spirit of SCD to Romania and clearly has the enthusiasm, courage, and ability to accomplish this. Perhaps, eventually, the group will host an International SCD event.